iPod Converter is a quickly convert almost all video formats to iPod and iPod to almost all video formats, It can convert almost all video formats including FLV to iPod,3GP to iPod,ASF to iPod,WMV to iPod, AVS to iPod,MKV to iPod,MOV to iPod,iPod to iPod, MP4 to iPod,MPG to iPod,MPEG to iPod,DAT to iPod, OGM to iPod,RM to iPod,RMVB to iPod,TS to iPod, TP to iPod,IFO to iPod,NSV to iPod,MP3 to iPod, AAC to iPod,WAV to iPod,WMA to iPod,CDA to iPod, FLAC to iPodM4A to iPod,MID to iPod,MKA to iPod, MP2 to iPod,MPA to iPod,MPC to iPod,APE to iPod, OFR to iPod,OGG to iPod,RA to iPod,WV to iPod, TTA to iPod,AC3 to iPod,DTS to iPod,BMP to iPod, GIF to iPod,JPEG to iPod,JPG to iPod,PNG to iPod. 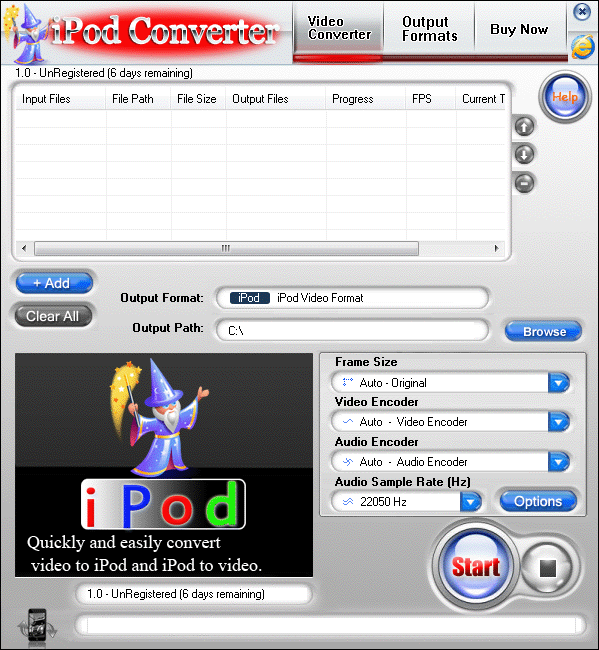 It also supports convert iPod to video formats including iPod to 3GP,iPod to iPod,iPod to FLV,iPod to iPod, iPod to MKV,iPod to MOV,iPod to MP4,iPod to OGG, iPod to PSP,iPod to RM10,iPod to RM20,iPod to SWF,iPod to WMV,iPod to M1V,iPod to M2V,iPod to AAC, iPod to AC3,iPod to MP2,iPod to MP3,iPod to WAV, iPod to WMA,iPod to VCD,iPod to SVCD,iPod to DVD.It also supports any user defined video file formats as the output. It has an unmatchable speed and high quality.